Our City Hall was built in 1916 on the North-East Corner of Main and 6th Streets. It was built in the Beaux Arts style for an extravagant $20,000. The top picture shows a photograph of the City Hall taken in 2004 as part of a pictorial trip through Main Street. 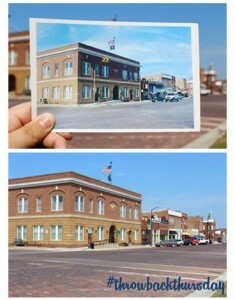 The bottom picture shows the City Hall today. With the exception of the removal of the caution light not much has changed! Join us every Thursday as we take a new look at a pictorial trip down Main Street.